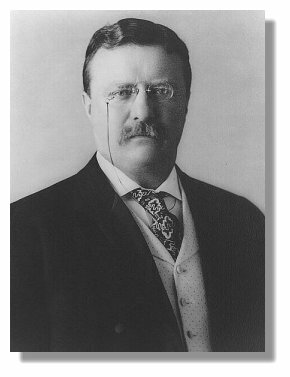 As a third-party candidate in 1912 he was the first to propose that America adopt social insurance, and his Progressive Party (aka the "Bull Moose" party) adopted the proposal in its platform. The Progressive Party platform can be seen as the forerunner of the Social Security program that TR's cousin, Franklin Roosevelt, would successfully push through Congress in 1935. Soundclip of TR campaigning for the Progressive Party (RealAudio format). Sound clip courtesy of Dr. Maurice Crane, Vincent Voice Library, Michigan State University. (Clips in MPEG format.) Video clips courtesy of the Library of Congress.